What factors contribute to a startup being labelled as high-risk? Startups with an inexperienced team. Startups with business models that depend highly on government regulations. Startups that require a large initial investment. Startups with businesses that have a small return potential. When investors are faced with startups that have these factors, they become hesitant to invest because, frankly, who would buy into a high risk and low return model? So that leaves another question: where do these high-risk startups turn to for funding? Cradle Fund Sdn Bhd has a direct equity product called DEQ800 that wants to solve this question. RM300,000 to RM800,000 will be invested into startups chosen under DEQ800. The focused areas include financial services, tourism, healthcare, agriculture, etc. 10 startups and 3 co-investment deals is set to be done under DEQ800 by the end of 2017. The investment horizon is between 7 to 10 years. 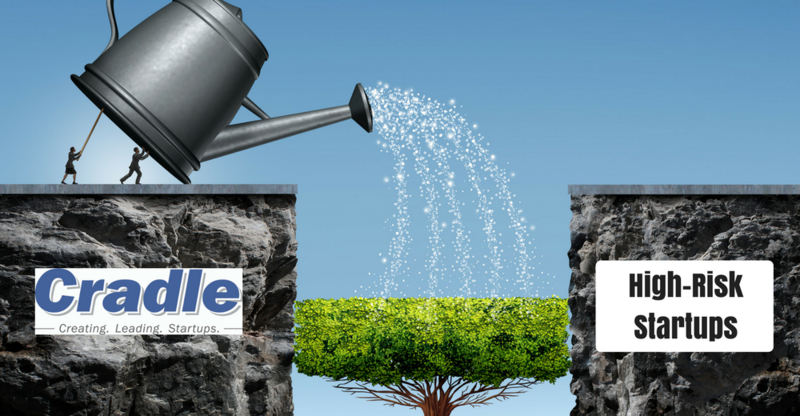 Cradle will hold less than 30% of the stake in the startups. For a full list of eligible criteria to apply for this programme, click here. According to Juliana Jan, Cradle’s Chief Investment Officer, DEQ800 was created because most startups beyond the development stage do look for alternative and not dependent on grants. Nazrin Hassan, Group CEO of Cradle, mentioned that one of DEQ800’s purpose is to close the funding gap existing in the nation’s seed stage where very few players are willing to invest below US$180,000. Experience: As an early stage funding player, Cradle has the experience in funding early stage startups, prototype and commercialization stage; and can gauge on the needs of these startups as well as their common downfall. Development: Playing their role as a developmental Venture Capitalist (VC), Cradle can provide startups with not only financial assistance but also with other value-added activities such as coaching, media access, training and many more. Ideally, startups that apply for DEQ800 are early stage startups who have a validated business model and products or services that address specific problems. “It doesn’t have to be innovative in terms of having a new technology or a new product, but it could be innovative in terms of business model. Even if the market is saturated, if they have a disruptive solution, we will want to look at them. What’s most important is a team who has the passion to build and grow the business,” said Juliana. So what makes DEQ any different? Aside from filling in a funding gap, Nazrin mentioned how DEQ800 fell in line with the government’s intent to wean the market off grants in funding early stage startups. The differences between CIP300 and DEQ800. He added that half of Cradle’s total allocation in 2017 given by the Ministry of Finance is in the form of equity funding as the agency gradually evolves from its grant funding model to equity investment model. “We believe DEQ800 will serve as a crisp avenue for startups with clear growth and good exit potentials at pre-seed and seed stages to raise capital for their businesses and help achieve these objectives,’’ said Nazrin. Click here for more information regarding DEQ800 and inquiries regarding application. This article was written in conjunction with Cradle.